D- Well balanced with a good combination of sweet, bitter, acid (from carbonation) and mouth feel. The alcohol is well hidden. I love Oskar Blues not because of their popularity but their beers really achieve another level,across from style to style my palate truly appreciates nearly all of the ones I've had.ive drank this beer many times and am now reviewing it.aroma smells like a very quality mash,mixed with some tangy and dank aromas,slightly sweet due to the eloquent malt bill and dry hopping.the head is a bit fluffy but calms down.tastes like an abundance of jammed out berries and dankish piney earthy hops.so much is going on with this beer,I've had it on draft and it's even more clean and open,grab a keg and your boys are in for a very savory drunk evening. 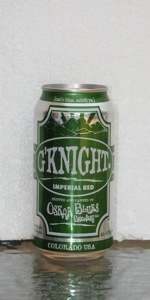 G'Knight actually looks like the red ale it boasts to be with a red/amber colored tone that is relatively opaque. Head disappeared fast for me, but the can sat on the shelf not the fridge section (absurd that companies do this). First smell was almost a straight medicinal syrup which kind of turned me off, but as I took the next sip the complex maltiness took over, with caramel & bread coming through. The maltiness overpowers the hops but does give it a "imperial red" taste that other red IPA's didn't really achieve. I expected more hops and was a little disappointed with the less noticeable dark herby hops and strange smell (kinda bandaid at times, not my favorite) but that being said this beer is very refreshing. I haven't tried many Red IPA's let alone imperial reds, but this one stands out from the others due to its darker tone, smell and appearence. I think I'll stick to just drinking one for now and call it a g'night. Pours a slightly hazy dark amber with a 2 inch foamy tan head that settles to a small cap on top of the beer. Foamy swaths of lace form around the glass on the drink down. Smell is very malty with some very nice herbal and peppery hop aromas. There is also a pineapple aroma I am getting as the beer warms up. Taste is of sweet malt balanced with herbal, peppery, and citrus zest hops. There is a mild bitterness on the palate after each sip. This beer has a light carbonation with a medium bodied and slightly sticky mouthfeel. Overall, this is a good DIPA but I am enjoying the aromas more than the flavors. A: It poured deep amber in color with a dense head. A low to moderate level of carbonation is visible. The head didn't last that long, but it left nice lacey patterns on the surface. S: There's a moderate aroma of piney hops in the nose. T: Piney hops dominate the flavors, but they are balanced somewhat by the underlying malt, which adds a slight amount of sweetness to the overall taste. There is some bitterness in the finish. M: It feels medium-bodied on the palate, crisp and a little sticky. D: The alcohol is well-hidden so it's relatively easy to drink. Who would have thought that something that tasted this good could come out of a can? I picked up a four pack of pint cans and it was already chilled. I’ve heard a lot of cool stuff about it so I grabbed some. This is an Imperial Red Ale with 8.70% ABV. Look-It pours a beautiful copper orange that reminds me of orange blossom honey. The head is thick and rich and settles to a thin layer shortly. The lacing is dropping, sparse, and wet. Smell-It has thick aromas of herbs, spices, and wood after some forthcoming plum and clove. It smells like caramel melting on top of papaya next to a bucket of pine sol and a burning cedar tree. Taste-I taste mango, grapefruit rind, pine resin, smoked cedar wood, chalky aspirin, zingy herbs, a full malt backbone that hides the ample alcohol content, and then a dry hoppy finish. There is a lingering coating on the tongue that tastes of pine resin, herbs, and alcohol. Mouthfeel-It feels silky smooth, rich and creamy as well as moist and full-bodied. Overall-The Red Ale is imperial in this case and deserves the name. Oskar Blues is excellent! Pours a murky, brownish red with a one finger, creamy, off-white head. Has plenty of carbonation and leaves nice lacing all the way down the glass. Smells of imperial funk, citrus, pine, malt and spice. Taste follows the nose. Great combo of malty red and lots of funky hop. Some brown sugar and candied fruit. Slight cherry. Nice oily mouthfeel compliments the funk. Slightly dry finish. A-Dark amber with a slightly off white head that sticks around when poured. S-citrusy hops lead on the nose and are followed by a floral sweetness. Maltiness if noticeable, but not overwhelming. T-bright but slightly resiny. citrus hops lead perfectly into malty sweetness. A great balance is acheived in this beer. The alcohol is hidden well, and leaves tropical notes of coconut (maybe just me) on the tongue. Finishes smoothly and not too bitter-a welcomed relief for many imperial IPA's. M- Carbonation is near perfect. Body is full, but still drinkable. O-Another knockout from Oskar Blues. Seems like everything they touch is gold. I would compare this to Sixpoint's Resin. Greatly enjoyed this beer. Only complaint i have is that the whole "Red' part seems redundant. This is an IPA through and through, with malts taking a backseat to the hops. Presentation: States that it's "a very big IPA from a very small brewery". Good enough for me! Appearance: A crystal clear ruby red pour fading to orange edges with a fluffy pancake looking beige head. This looks like a bock! Pretty crazy. Smell: Piney and resiny hop notes going on here. Maybe a touch of grassiness and almost a prickly smell that I can't quite identify other than to describe it as hops with some alcohol esters. Taste: Bittering pine hops are up front some carmel and brown sugar notes are trying to come through but are quickly beaten down by the hops. Hints of orange and lemon rind throughout. There is a slight smokiness to it but it doesn't overpower at any point. It definitely lives up to the bill of a "Big IPA". The alcohol is balanced and hidden well. Mouthfeel: Medium bodied and not as thick as I had hoped. Still, very good with a nice dry finish. Drinkability: Can't see myself drinking more than one of these. My palate is pretty blown at this point. A very big beer that is very nicely done. A - orangey red, clear, pours a big rocky head that recedes quickly to a splotchy, bubbly cap, but leaves plenty of lace. T - Bitter grapefruit hits me right off the start, but there is strong battle going on between hops and malt. Getting some biscuity notes in the malt, but not too strong (I don't care for large amounts of this character in an IPA). I find the aftertaste is not very long lasting, you get a quick hit of bitterness, and then it's gone. Extremely clean tasting all the way through. M - mouthfeel is very full and creamy, but resiny hops keep it from being syrupy. Alcohol is completely hidden. D - a tasty, malty double IPA, with only minor quibbles. Ridiculously easy to drink. If one was to call a double IPA "approachable," this would be a good example. Well developed malt bill, with a balanced dose of tasty hops. I do find that the quick finish does not quite match the rest of the beer, but it sure does make you want to grab another sip in a hurry. What is interesting, is that after getting half way through the serving, my burps start to provide the lingering bitterness that I was looking for! Thanks to Demcorhip for sending this rare treat my way! Thanks to dangle47 for tossing this one my way. Pours a deep amber with bright orange highlights and a two-finger pillowy, off-white head that fades real slowly to a thin cap. Great lacing. Smell is an onslaught of citrus and piney hops: orange peel, lemon zest, grapefruit and balsam fir. Taste is bitter citrus hops up front, with a solid background of biscuity, bready malts. There's a caramel/toffee presence in the middle that leads right back into some lemon and grapefruit flavors and a nice dry finish. Drinkability is near perfect for me. I just wish this was available at my local stores in NH. Serving glass: Poured from can into Nonic Pint. Appearance: Slightly hazy amber with moderate off-white head and slight lacing. Smell: Pine and grapefruit at first, but that quickly mellows out, leaving mostly caramel behind. Taste: Semi-sweet caramel backbone with nice grapefruit and pine riding along the top. Taste is more mellow than I expected but well balanced and tasty. Somewhat bitter finish. Feel: Smooth, oily and creamy with carbonation on the lighter side of moderate. Finish is nicely dry. Very nice mouthfeel. Overall: Exceptionally well balanced beer that is quite pleasant and completely belies its higher abv. While I could have used a little more oomph, it is hard to argue with what is here. Retried this again, definitely boosting it up. There's something about oskar blues beers that make them unique. Loved the taste this time around more than i remember. 12oz can (canned 8/2/2011) poured into a tulip. Pours a hazy orange with a thick off-white head. Aroma is pine, gooey tropical fruit, caramel malt, and citrus. In a word, dank. Taste is sticky caramel malt, mango, and alcohol. This is heavy and pretty boozy. The malt and hops work together well, but this is definitely on the maltier side of DIPAs. Pours a really nice almost see thru medium dark amber color. Has a thick, mountainousy, foamy two finger head. Leaves a huge lace trail and has zero carbonation bubbles. The inital aroma i got was of hops and a bit of citrus maybe grapefruit? Maybe even orange and I'm getting a sweet smell of caramel too. It tastes sweet at first, then you get a citrusy, caramel flavor after. Has a definite hoppy taste to it too. Heavy mouthfeel with a slight lingering bitterness in the finish. Overall this is a really good beer! It was my first from the Oskar Blues Brewery and I look forward to try the others! Taste: Malty and sweet, almost like oatmeal on the front end, with a touch of bitterness to the after-taste. Mouthfeel: Medium, between thick and thin. Somewhat silky with a very mild after-taste that hangs around like all good bar bands after the show smoking cigarettes until sunrise.